Remember way back five seconds ago when we had our first giveaway that our blogging buddy Tim won? 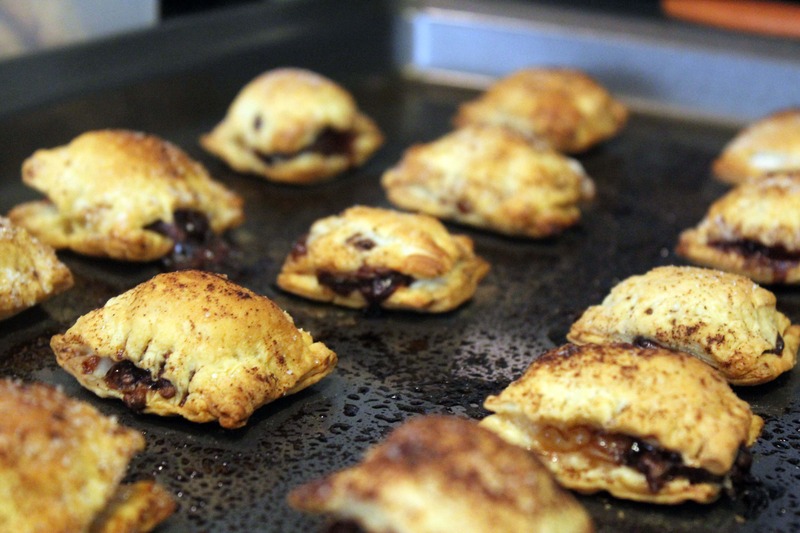 Well, part of that giveaway was two other winners that suggested puff pastry recipes for us to try. This is the first one! One of the winners, Angela, suggested that we make something involving chocolate. 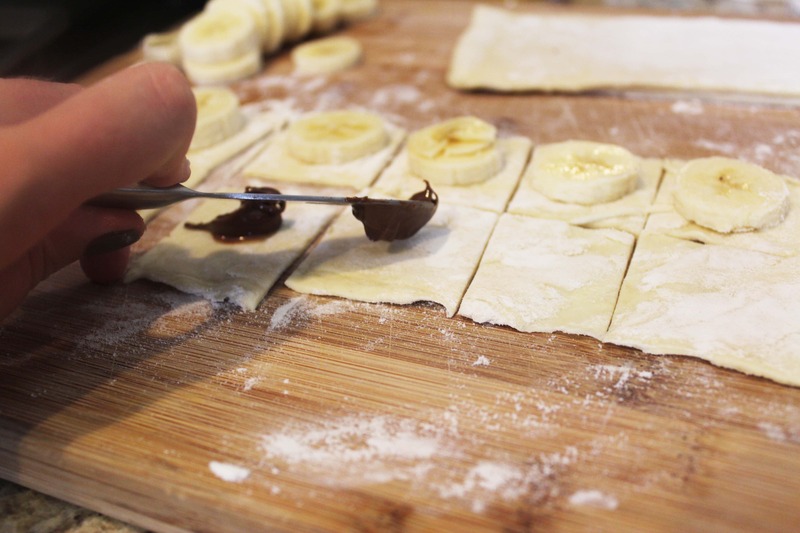 I was super psyched about this assignment because pastry and chocolate are delicious, no matter what you do to them. Then I remembered this one time I was in Philly with my friend Bryn and we had brunch at this super awesome place near here house and I ate crepes with bananas and nutella. 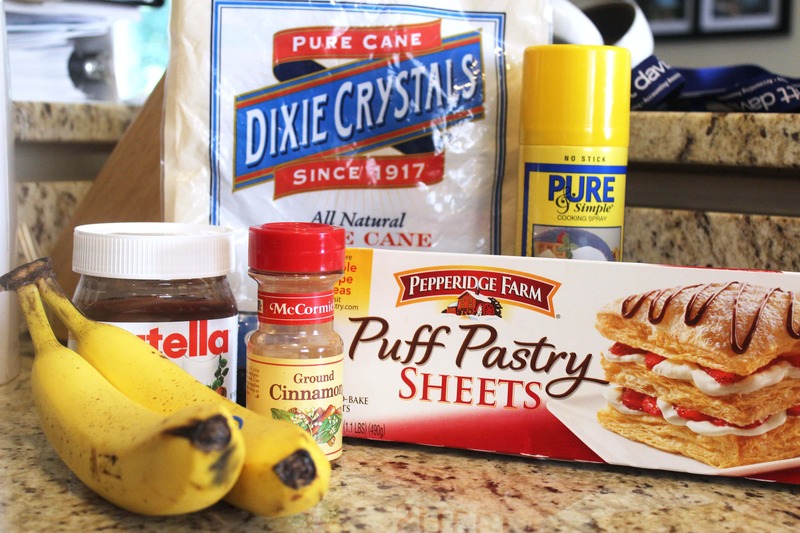 And then I made pastries with bananas and nutella. It made sense to me at the time. This is pretty basic stuff, guys! 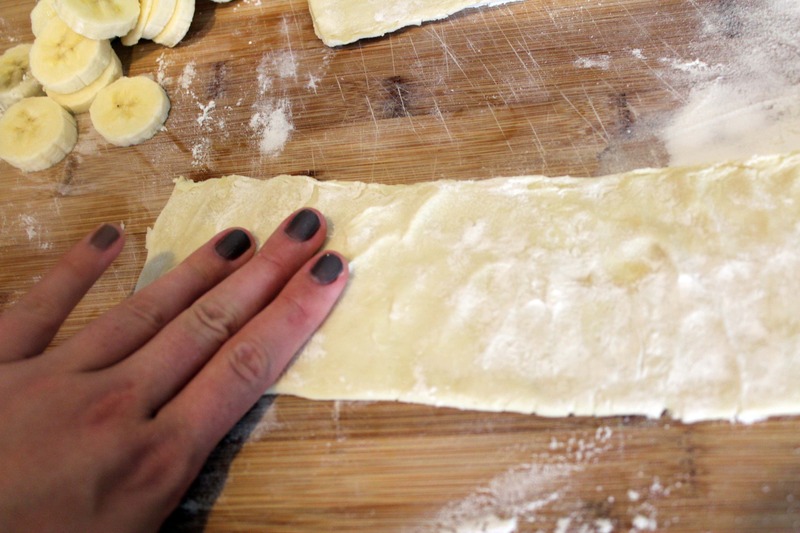 Puff pastry stays frozen, so you’ll want to let it thaw in the fridge overnight or on the counter for 30 minutes or so until it’s soft. 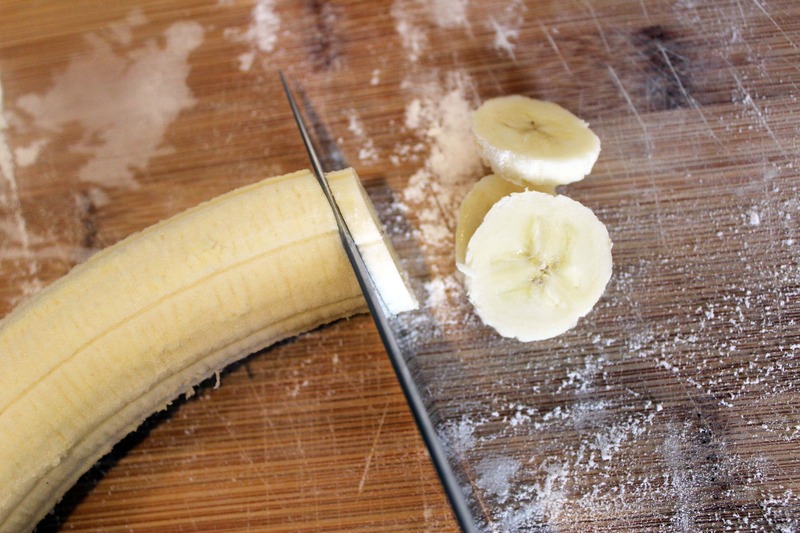 Go ahead and slice the banana into slices – not too thin, not too thick. 1/6th of an inch. Yes. 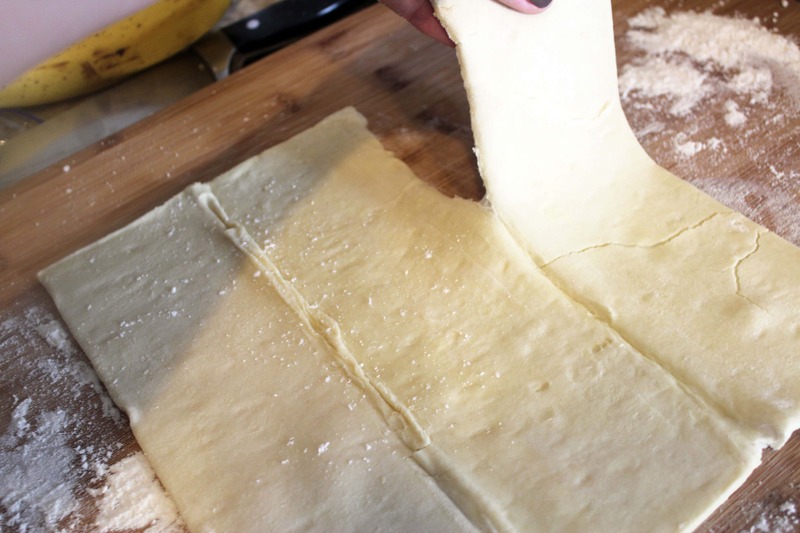 When you’re ready to assemble the pastries, separate the puff pastry into three equal panels – use the fold lines that are already on it! 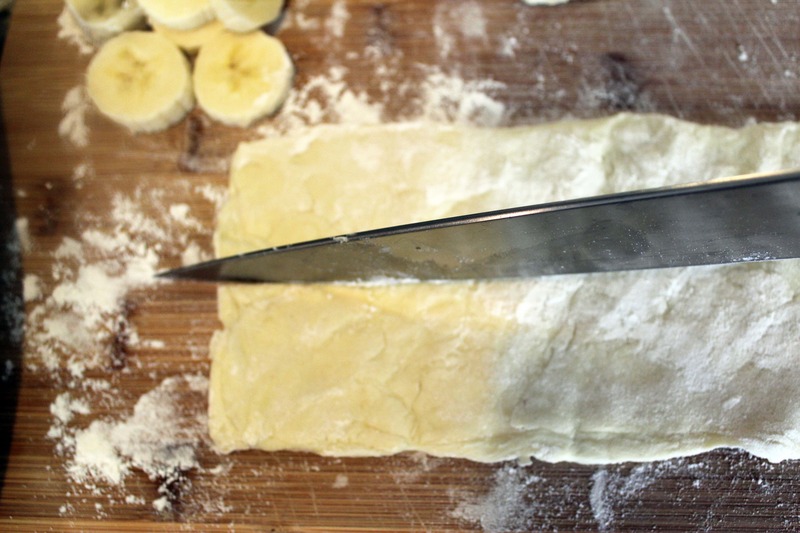 Use as much flour as you need while you’re working with the pastry to be sure it doesn’t stick to the board you’re working on. Then, use your fingers to lightly stretch the panel to be a bit wider than it’s original size. 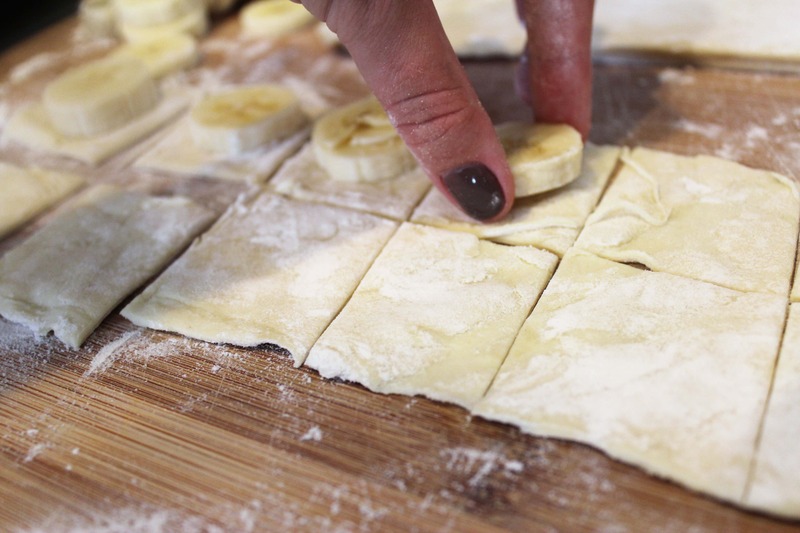 If you’re measuring using the banana, you should be able to make two rows of banana slices with some room to spare – stretch the pastry to THAT width. I stretched mine to about 3.5 inches wide – the length didn’t change much. 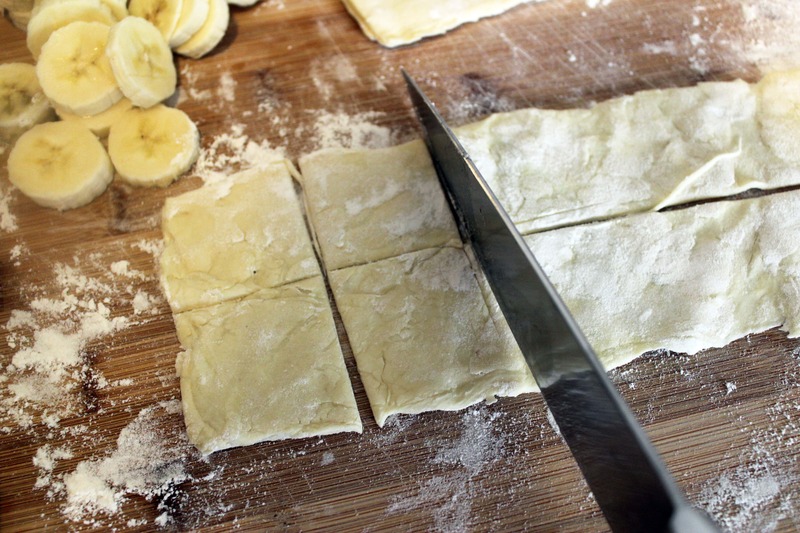 Then, use a sharp knife to cut the pastry into two long strips, and then cut the strips into little squares – I got 12 – 14 squares per panel of pastry. This will depend on how thick your banana is. Hehe. 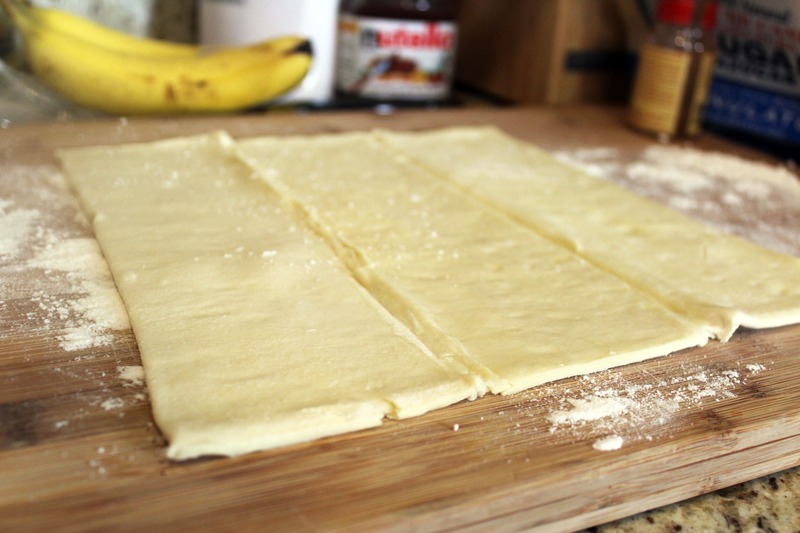 Once you have your pastry squares, place a slice of banana on half of the squares. 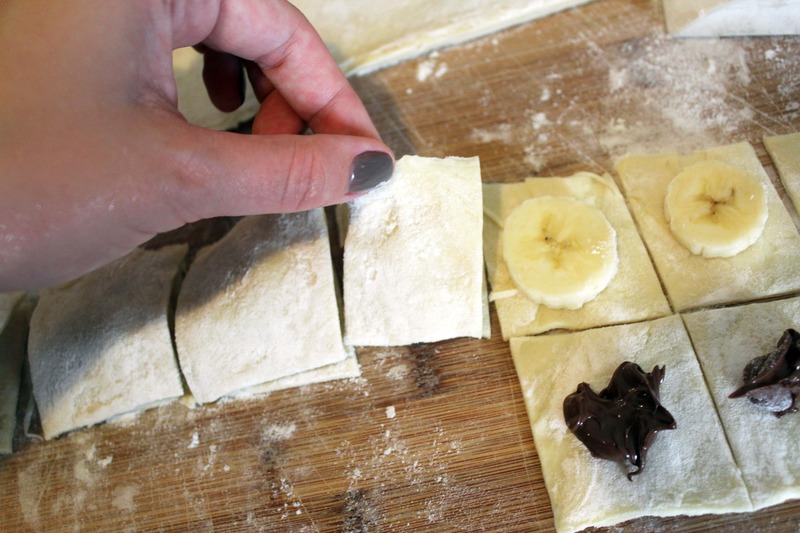 Then, put a little blob of nutella on the other squares! 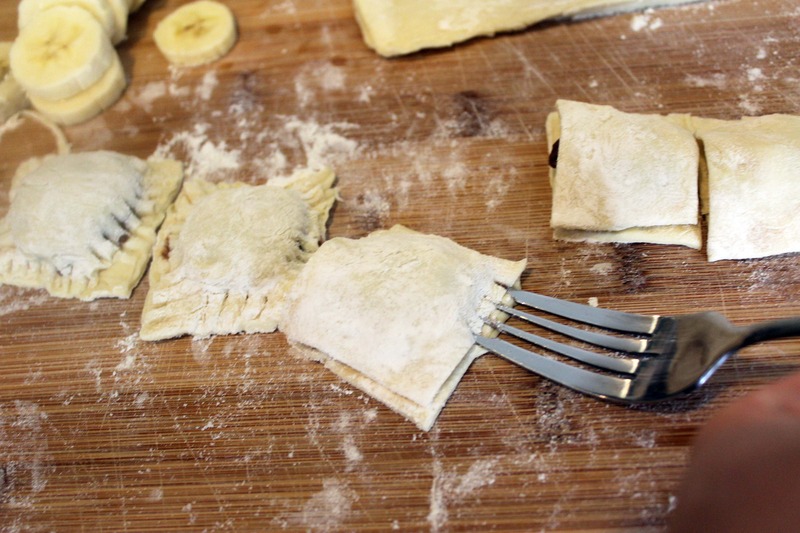 ….and use a fork to press the pieces together like little ravioli. 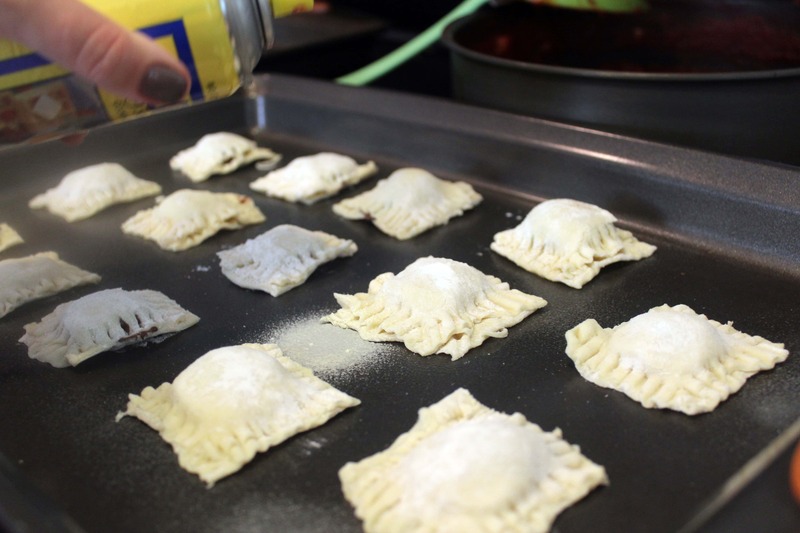 Now, spray a large pan with cooking spray and place the pastries 1 inch apart on the pan. 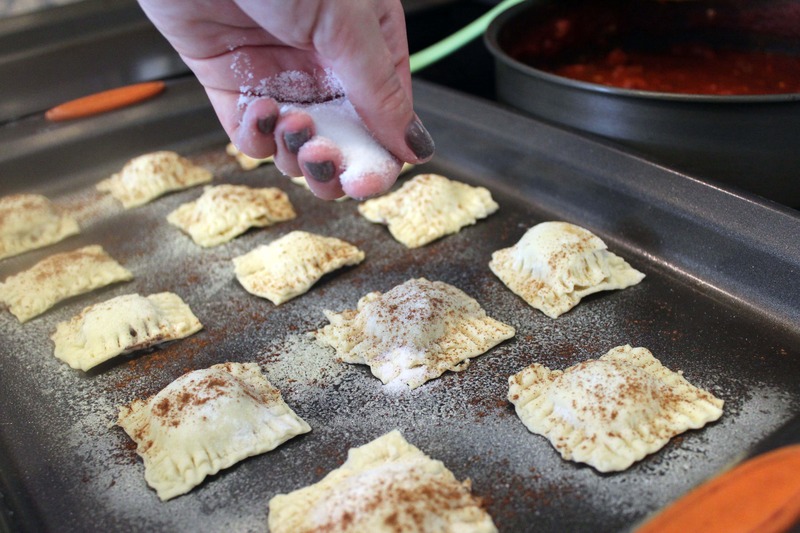 Then, spray the tops of the pastries as well. 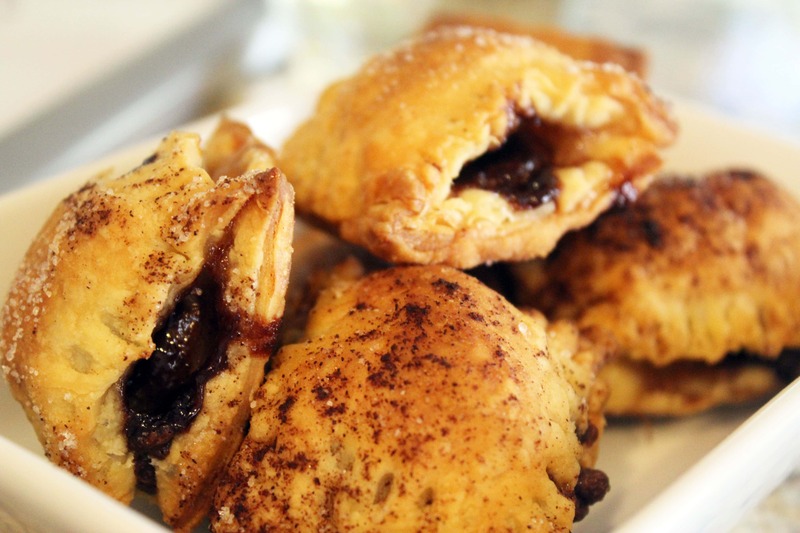 Sprinkle the tops of the pastries with a little cinnamon and sugar. Yum! Now, at this point you can leave the pastries alone for awhile, or you can go ahead and bake them! Whenever you’re ready to bake them, preheat the oven to 400F and bake the pastries for 12 – 15 minutes until they’re golden brown and puffy. That’s it! 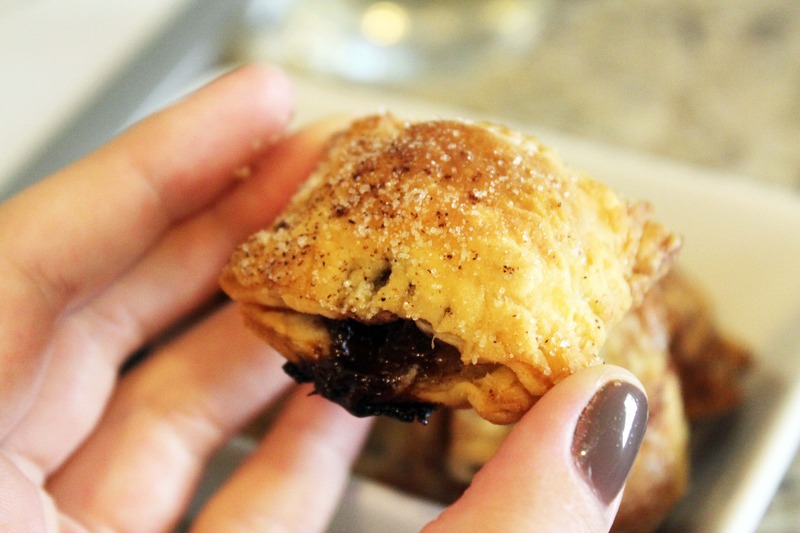 Because I didn’t cut vents in the pastry, some of the nutella escaped around the edges, but I didn’t mind that one bit. You’re welcome to poke a hole in the top of the pastry before you bake them, but I’m not sure that’s necessary. These are great hot, cold, room temperature…WHATEVER. If you want to reheat them, we’ve found that a toaster oven works really nicely! Enjoy these, and thanks to Angela for the idea! 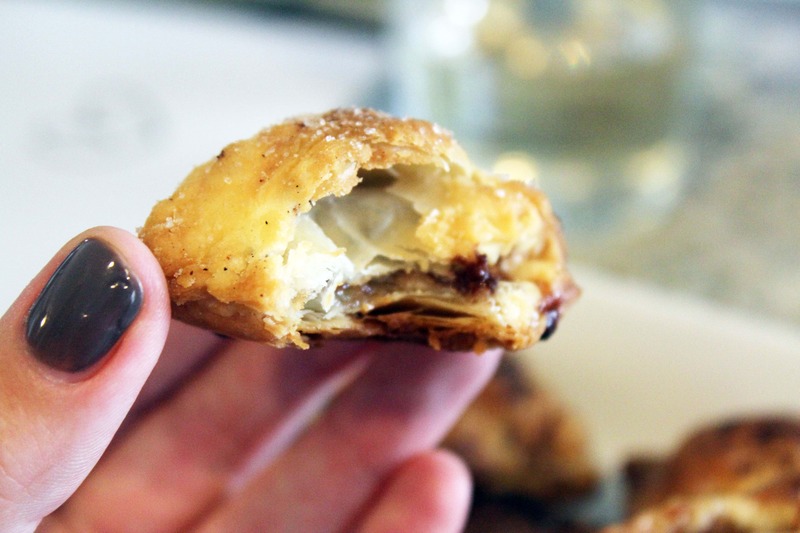 They’re great fun, and I’d imagine that you could fill tiny pastries like this with, um, anything you freaking want. P.S. the other winning suggestion was beef wellington. 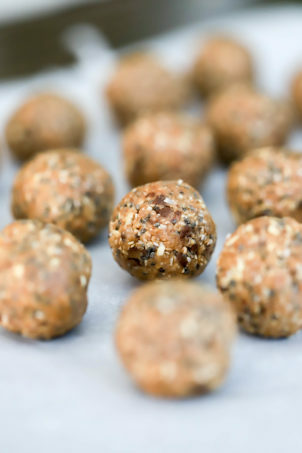 That’s coming up as soon as we do enough yoga to make up for a week of eating these little guys. Wait for it. 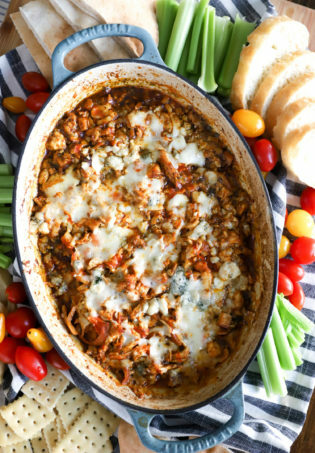 This is definitely weekendy enough to be a part of a Weekend Potluck – check out the delicious Tonya and her family over at 4LittleFergusons. 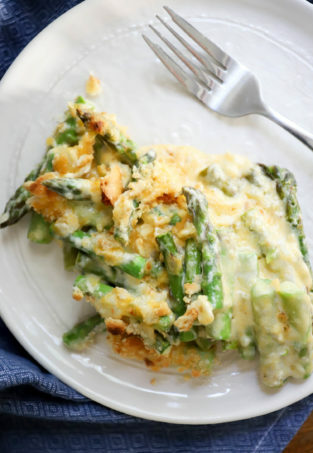 She, Marsha, Kim&Julie, Holly, Brandie, and Tabitha all have this fun roundup of recipes each Friday – there are some great ideas for what you might make at some point this weekend! 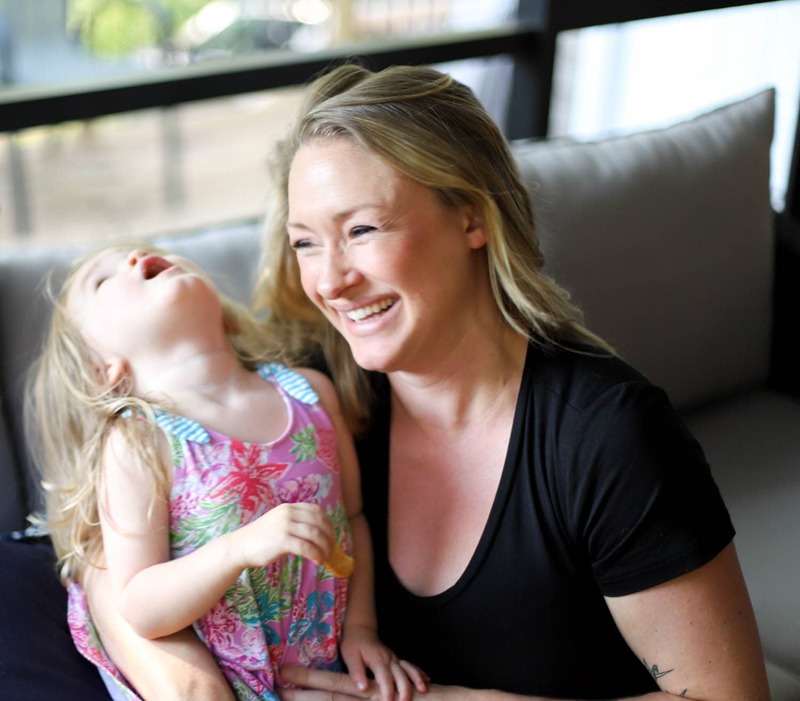 Click here to see the latest list! I’ve had Beef Wellington prepared with puff pastry by the lovely Carol Allison. It was the bomb!! It looks delicious! good one! oh! 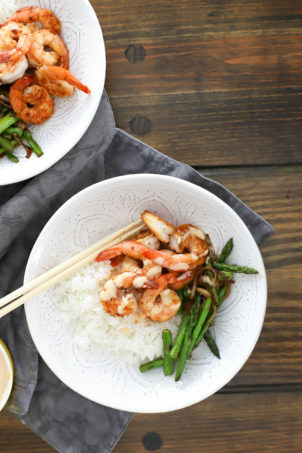 These sound so delicious! I love how in-dept your pictures are on showing the process! Thanks dude! If you make them send me a picture!